How long has shadow puppetry been around? Where was shadow puppetry developed? Have you ever used just your hand, a light and a wall to make a shadow figure? Perhaps it was a dog or maybe a rabbit? If so, you've already had some experience with shadow puppets! Shadow puppetry — also called shadow play — got its start thousands of years ago in China and India. This unique form of storytelling is the oldest type of puppetry in the world. Shadow puppets are figures that are placed between a light and a screen. Moving them creates the illusion of moving images on the screen. An experienced puppeteer can make figures appear to walk, talk, fight and dance. Shadow puppetry is a popular form of entertainment in countries all over the world. China, India, Indonesia and Turkey have been especially important in the development of this art form over time. The types of stories told with shadow puppetry vary from country to country. For example, in China, shadow plays are usually based upon Chinese legends and folk tales. Shadow plays often reflect important themes from Chinese operas. In Indonesia, shadow plays tend to be based upon religious stories of good vs. evil. These plays help to reinforce traditional values of native culture. Turkish shadow plays, on the other hand, are more lighthearted. They often use humor to tell stories based upon the events of everyday life. The first shadow puppets were likely made out of animal hides. Since they were strong and flexible, they allowed the puppeteer to move the puppet easily to create the desired effects on the screen. Leather is still a popular material used to make shadow puppets today. Shadow puppets can be made from a wide variety of materials, though. 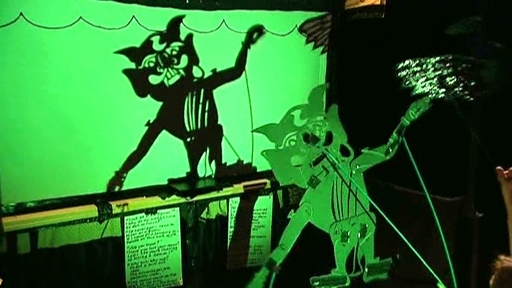 Today, you might see shadow puppets made out of paper, plastic, wood or cloth. There's really no end to how creative puppeteers can be when making their puppets. Shadow puppets are usually constructed in separate pieces that are then put together with strings or wires. The strings or wires are usually attached to long rods that the puppeteer will use to control the movement of the puppet. Although shadow puppets can be very creative and elaborate, they also can be very simple. 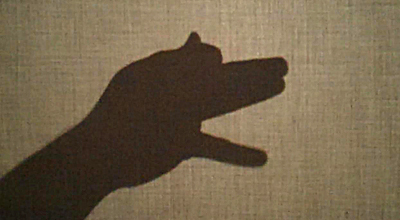 Basic shadow puppets can be made by students. With little or no experience, a classroom can put on a simple shadow play with little expense and just a little time. The next Wonder of the Day® is a SLAM dunk of another sort! Meet us in Wonderopolis tomorrow for a real "wordy" competition! Ready to try some shadow play? True shadow puppets can take a lot of time to make. Did you realize that you can perform your own shadow plays with just your hands, though? It's true! With a light, a wall and your hands, you can learn to make a wide variety of different shadows. Get a friend to learn alongside of you and you can put on your own shadow play in no time. For help learning how to use your hands to make shadow figures, jump online to check out Learn How To Do Hand Shadow Puppets. You can learn how to make birds, camels, deer, dogs, rabbits, pigs and many more! Hi, John! Wonder 848: Where Do the Buffalo Roam? talks about bison! Sorry to hear that you didn't like this Wonder! Luckily, though, we have many more Wonders for you to check out!! Let us know what you think, we love hearing from you! Wow I have seen many talented and wonderful acts but this has to be one of my favorites. I loved the penguins!!! Awesome! I wonder how they do that!!!! We WONDER what your favorite shadow puppet is? Hi wonderopolis. 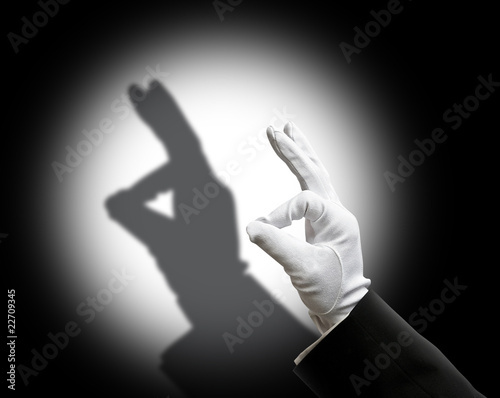 Shadow puppets are when you take your hand and you put your hand over light and you make your hand a design, because I once took my hand over light and I made a bunny. Have a happy WONDERing day Wonderopolis. That video is the coolest thing my friend Maegan has ever seen. That was awesome! I wish I was there to see that in person. I love Wonderopolis!!!!!!! I check it every day!!!! Thanks for creating this website!!!!! Hi! I'm from Mr. Draper's class. I really like the video it was cool! It was cool. I like to make shadow puppets. I think tomorrow's wonder is about fries...is it? WOW! I find this extremely interesting and cool! The video was awesome!! Thanks, man! That was an awesome video. I think tomorrow's wonder is about flowers, because it is spring. I hope you have a WONDERful day! Hi guys! I actually saw a Chinese movie that had shadow puppets in it and it was so cool! Also at an art museum there was a Japanese guy who came and showed them and did a little show! It was amazing!